Some interesting longitudinal results on female persistence through graduate school in STEM. Post-PhD there could still be a problem, but apparently this varies strongly by discipline. These results suggest that, overall, it is undergraduate representation that will determine the future gender ratio of the STEM professoriate. For decades, research and public discourse about gender and science have often assumed that women are more likely than men to “leak” from the science pipeline at multiple points after entering college. We used retrospective longitudinal methods to investigate how accurately this “leaky pipeline” metaphor has described the bachelor’s to Ph.D. transition in science, technology, engineering, and mathematics (STEM) fields in the U.S. since the 1970s. Among STEM bachelor’s degree earners in the 1970s and 1980s, women were less likely than men to later earn a STEM Ph.D. However, this gender difference closed in the 1990s. Qualitatively similar trends were found across STEM disciplines. The leaky pipeline metaphor therefore partially explains historical gender differences in the U.S., but no longer describes current gender differences in the bachelor’s to Ph.D. transition in STEM. The results help constrain theories about women’s underrepresentation in STEM. Overall, these results point to the need to understand gender differences at the bachelor’s level and below to understand women’s representation in STEM at the Ph.D. level and above. Consistent with trends at the bachelor’s level, women’s representation at the Ph.D. level has been recently declining for the first time in over 40 years. Conclusion: Overall, these results and supporting literature point to the need to understand gender differences at the bachelor’s level and below to understand women’s representation in STEM at the Ph.D. level and above. 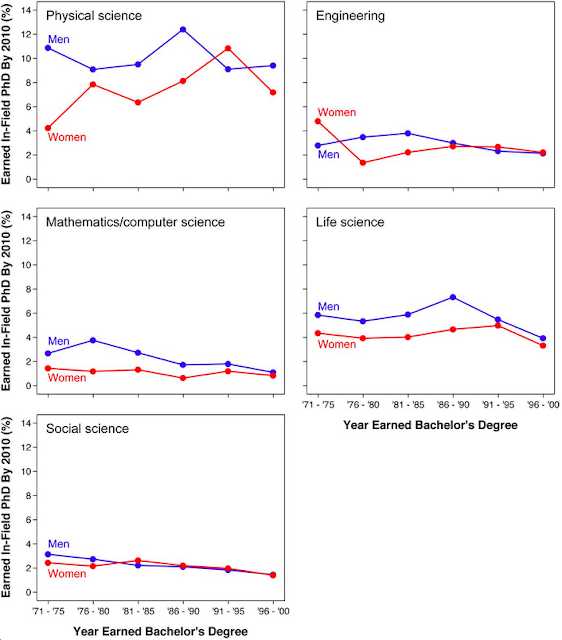 Women’s representation in computer science, engineering, and physical science (pSTEM) fields has been decreasing at the bachelor’s level during the past decade. Our analyses indicate that women’s representation at the Ph.D. level is starting to follow suit by declining for the first time in over 40 years (Figure 2). This recent decline may also cause women’s gains at the assistant professor level and beyond to also slow down or reverse in the next few years. Fortunately, however, pathways for entering STEM are considerably diverse at the bachelor’s level and below. For instance, our prior research indicates that undergraduates who join STEM from a non-STEM field can substantially help the U.S. meet needs for more well-trained STEM graduates (Miller et al., under review). Addressing gender differences at the bachelor’s level could have potent effects at the Ph.D. level, especially now that women and men are equally likely to later earn STEM Ph.D.’s after the bachelor’s.